A few days ago, I made this amazing dish I found on Gimme Some Oven. It looked so mouthwatering I had to add it to my menu right away. This recipe didn’t disappoint! 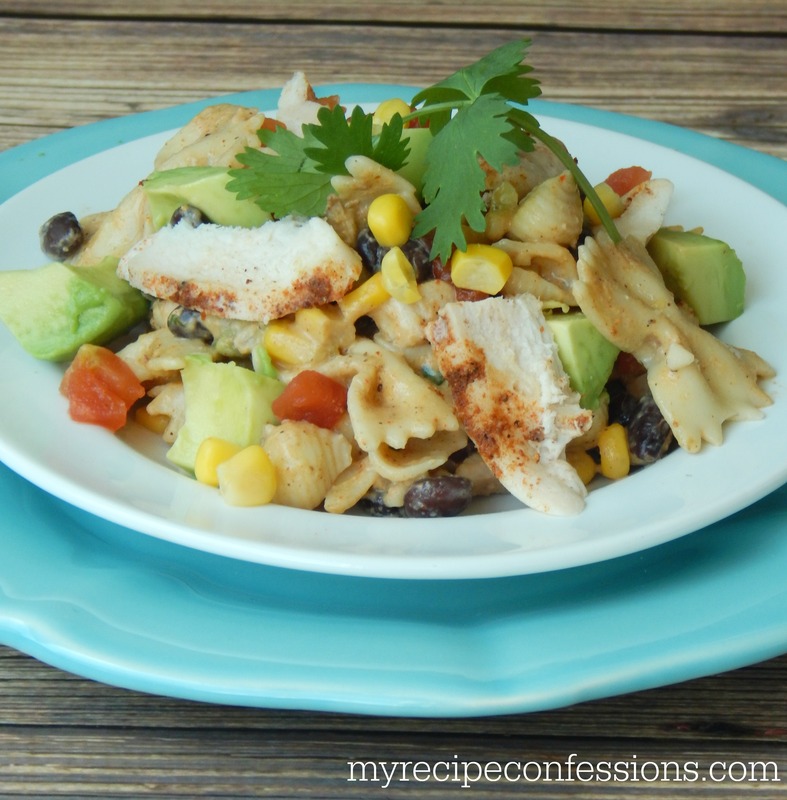 It was quick to throw together and the flavor was absolutely divine! I ate the leftovers for lunch the next day and it was just as good as the first day. The avocado in the pasta will turn brown after a day of two. I just picked the brown ones out and added a fresh avocado. I did however switch out the cayenne pepper for smoked paprika. My family doesn’t like a lot of spice in their food. Smoked paprika gives a bit of a kick but not enough that my kids complain about it. I would highly recommend this recipe! I know I am going to be making it again and again for my family! 1. In a small bowl combine the chili powder, cumin, smoked paprika, salt, and pepper. Set aside half of the seasoning mixture. Sprinkle the other half of the seasoning mixture and sprinkle it over both sides of the chicken filets. 2. In a skillet heat 2 tbsp. of olive oil over medium-high heat. Add chicken to the skillet and cook completely until the chicken is no longer pink inside, about 3 to 4 minutes on each side. Remove the chicken from the skillet and let it rest for 10 minutes. Then slice the chicken into thin strips. 3. Return the skillet back to the heat and add the remaining 2 tbsp. of olive oil. Add the onion, garlic, tomatoes and corn and saute for 5 minutes, stirring occasionally. Add the cream cheese and milk gradually, stirring constantly until the cheese melts completely. Be careful not to let the cheese burn on the bottom. 4. Stir in the remaining seasoning mixture, black beans, and cilantro until combined. Remove from heat, then gently stir in the avocado and pasta. Serve immediately with additional toppings. 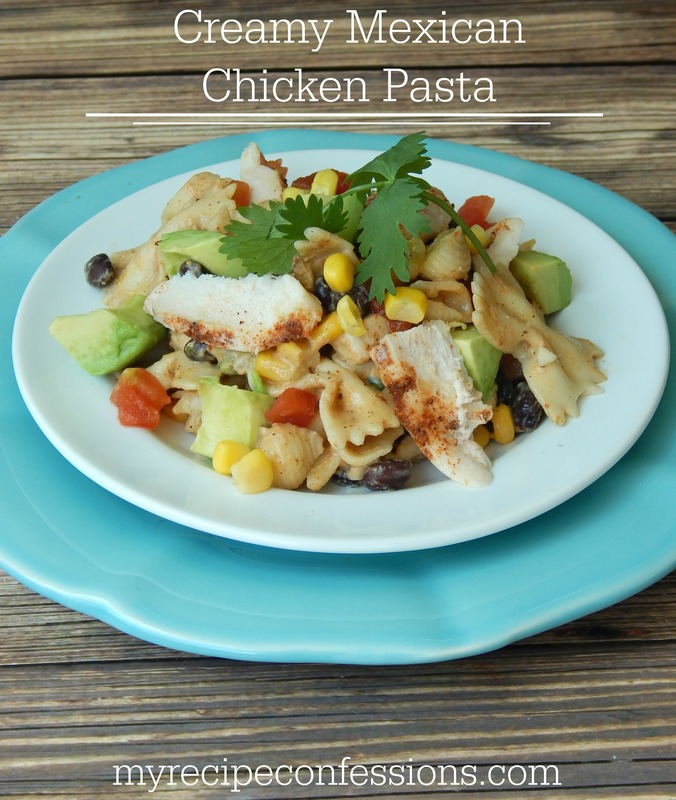 This recipe is adapted from Creamy Mexican Chicken Pasts by Gimme Some Oven.